With a Native American heritage and a distinct Spanish flavor, Mexico is vibrant, colorful and unique. Its varied terrain ranges from cactus-studded deserts to white sandy beaches and blue waters, tropical rainforest and jungle-clad hills to steep rocky canyons and narrow gorges, and from snow-capped volcano peaks to bustling cities. Since the height of Mayan and Aztec civilizations, Mexico has suffered the destructive force of the Conquistadors, European colonial rule, civil and territorial wars, rebellions, dictatorships, recessions and earthquakes. Yet its people remain warm and friendly, much of the countryside remains unspoiled by development, and its cities display a unique style of architecture. The extraordinary history is reflected in the ancient Mayan temples strewn across the jungles and ruins of Aztec civilisations, rural indigenous villages, Spanish colonial cities and silver mining towns, and traditional Mexican ports. 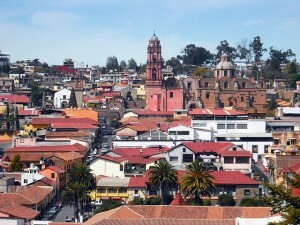 Buildings display a unique combination of colonial and pagan architecture, blending together Art Nouveau, Baroque, Art Deco and Native American design into the structure of their churches and public structures. The country’s culture displays a similar blend of the traditional and modern, where pagan meets Christian in a series of festivals, or fiestas throughout the year. Besides a combination of unique culture and fascinating cities, Mexico also boasts several hundred miles of coastline extending down through both the Pacific and the Caribbean, which has branded the country as a popular summer retreat destination. Beach resort cities such as Acapulco, Cancun and those of the Baja California peninsula are accepted vacation havens. 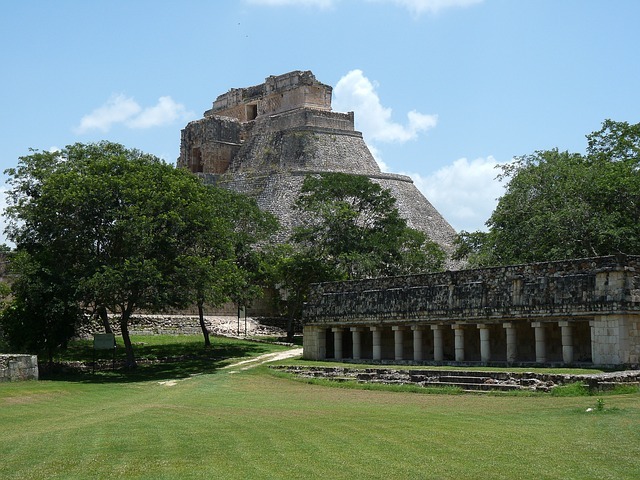 The countryside is also rich in archaeological treasures with pyramids, ruins of ancient cities and great stone carvings of ancient gods standing as testament to a country once ruled by the Aztecs and Mayans. No time is a bad time to visit Mexico, though the coastal and low-lying regions, especially in the southern half of the country, are fairly hot and humid from May to September (these are the months of highest rainfall and highest temperatures almost everywhere). The interior of the country has a more temperate climate than the coasts. In fact, it’s sometimes decidedly chilly in the north and the center from November to February. July and August are peak holiday months for both Mexicans and foreigners. Other big holiday seasons are mid-December to early January (for foreigners and Mexicans) and a week either side of Easter (for Mexicans). At these times the coastal resorts attract big tourist crowds, room prices go up in popular places, and accommodations and public transportation can be heavily booked, so advance reservations are advisable. Why not time your travels to Mexico to coincide with a festival or three? Mexico’s many fiestas are full-blooded, highly colorful affairs, which often go on for several days and provide the chili in the recipe of Mexican life. In addition to the major national festivals listed here, each town has many local saints’ days, regional fairs, arts festivals and so on (see specific destinations for more information). There’s also a national public holiday just about every month, often the occasion for yet further partying. Your dollar, euro or pound will go a long way in Mexico. Assuming the peso’s exchange rate against the US dollar remains fairly stable, you’ll find this is an affordable country to travel in. Midrange travelers can live pretty well in most parts of the country on US$75 to US$125 per person per day. Between US$40 and US$70 will get you a pleasant, clean and comfortable room for two people, with private bathroom and fan or air-conditioning, and you have the rest to pay for food (a full lunch or dinner in a decent restaurant typically costs US$15 to US$25), admission fees, transport, snacks, drinks and incidentals. Budget travelers staying in hostels can easily cover the cost of accommodation and two restaurant meals a day with US$40. Add in other costs and you’ll spend US$60 to US$80. The main exceptions to this are the Caribbean coast, parts of Baja California and some Pacific resort towns, where rooms can easily cost 50% more than elsewhere. Extra expenses such as internal airfares, car rentals and shopping push your expenses up, but if you have someone to share expenses with, basic costs per person drop considerably. Double rooms often cost only a few dollars more than singles, and triple or family rooms only a few dollars more than doubles. Rental cars start at around US$50 to US$60 per day, plus fuel, and cost no more for four people than for one. At the top end of the scale are a few hotels and resorts that charge over US$200 for a room, and restaurants where you can pay US$50 per person. But you can also stay in smaller classy hotels for US$80 to US$120 a double and eat extremely well for US$40 to US$50 per person per day. Mexico’s currency is the peso, usually denoted by the ‘M$’ sign. Any prices quoted in US dollars will normally be written ‘US$5’ or ‘5 USD’ to avoid misunderstanding. The peso is divided into 100 centavos. Coins come in denominations of 20 and 50 centavos and one, two, five, 10, 20 and 100 pesos. There are notes of 20, 50, 100, 200, 500 and 1000 pesos. The most convenient form of money in Mexico is a major international credit card or debit card – preferably two if you have them. Visa, MasterCard and American Express cards can be used to obtain cash easily from ATMs in Mexico, and are accepted for payment by most airlines, car-rental companies and travel agents, plus many upper midrange and top-end hotels, and some restaurants and stores. Occasionally there’s a surcharge for paying by card, or a discount for paying cash. Making a purchase by credit card normally gives you a more favorable exchange rate than exchanging money at a bank, and isn’t subject to commission, but you’ll normally have to pay your card issuer a ‘foreign exchange’ transaction fee of around 2.5%. As a backup to credit or debit cards, it’s a good idea to take a little cash and a few trav­eler’s checks. US dollars are easily the most exchangeable foreign currency in Mexico. In tourist areas and many Mexican cities along the US border, you can often make some purchases in US dollars, though the exchange rate used will probably not be in your favor. Euros, British pounds and Canadian dollars, in cash or as traveler’s checks, are accepted by most banks and some casas de cambio(exchange houses), but acceptance is less certain if you’re away from main cities and tourist centers. Traveler’s checks should be a major brand, such as American Express or Visa. From January 2007, U.S. citizens will need a valid passport to travel to Canada, Mexico, and various parts of the Caribbean. The specific requirements are subject to change – for the latest information check the Department of State website. Nassau, capital city of The Islands of The Bahamas, resides on New Providence Island, neighbor to Paradise Island. This island pair maintains a distinct blend of international glamour and tropical ease, giving travelers freedom to do everything or nothing at all.